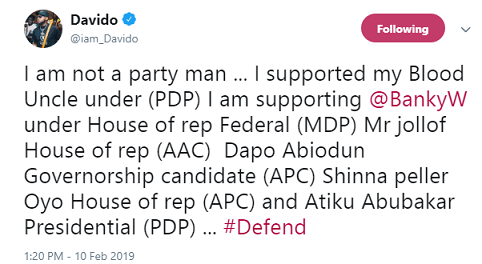 Davido just now disclosed on twitter those who are his candidates in next week election. Shockingly all his candidates don’t belong to PDP. Before he started, he made it clear that he is not a party man, hence, his fans shouldn’t be shocked. Check out his candidates and their positions below. Earlier today, Davido, who is certainly not in support of the re-election of President Buhari, expressed his displeasure at the enthusiasm many people are showing towards re-electing President Buhari. He took to his insta-stories to vent his frustration on the way some people thinks.